Libby's Little Addiction: Spread the Love for Jaimie! Spread the Love for Jaimie! On October 4th, four teenagers armed with knives broke into a home in a small town in New Hampshire. Alone and sleeping inside were a mother and her 11 year old daughter. These four boys broke into this home with the intent to rob and kill anyone inside. They stabbed the mom, Kimberly Cates, to death and left her daughter, Jaimie, for dead in their driveway. It was a completely random act, their home was chosen only due to its secluded surroundings. If you happened along the hop at my blog, please head back to the beginning by visiting Katharina. At the end of the hop you will find a new blog called Stamp Something...For Jaimie: Spreading Love and Hope. Please be sure to visit that blog - you can read more about Jaimie, and also participate in the Card Drive Challenge. Many generous sponsors have donated prizes to be given away randomly - you have until the end of the hop, Monday, November 9 at 10am EST to get in the drawing. And finally - continue along this hop by visiting Jenni! Now some details about my card - I heard that Jaimie likes black and hot pink, so I went with that color combo. The fabulous sassy cat stamp is designed by my friend Lydia - her Maddie Stamp is part of a fundraiser for homeless kitties. (You know you want to go buy one!!) And I used Taylor's latest fabby sketch. Thanks for stopping by today!! Being a part of the blog hop, I wanted to hop around and see all the cards the participants made too. This is very nice - Jaimie is really going to be touched!! OOOHHHH - I am so touched you picked my little Maddie!! She will love that card - it's adorable!!! Cute little kitty and love the colors you chose for it! What a wonderful card! I'm sure Jaimie will love it. Thanks for joining the hop today! What a cute card... Love the kitty cat! Beautiful card. I am so glad that I am part of this amazing blog hop :-). great card Libby! glad you are participating too!! OMG, so stinkin' cute! I LOVE the Maddie stamp. One of my go-to stamps, it is! FAB card! Thanks for telling me about the hop! This is adorable! Jaimie going to love the kittie and all the pink/black! Awesome creation! Love your card Libby! It's fabulous! That's super cute! Glad to be part of the hop with you! Hi Libby - what a gorgeous card for Jamie, I love that adorable image - I am so thrilled to be part of this amazing expression of love for Jaimie with stampers like yourself! Thank you for 'Spreading the Love!' God bless you! I love your card for Jaimie. It's just prefect! Great card Libby - a really striking layout. great card! I love sassy cat! I have always loved this stamp....and for such a good cause! Sweet card, such a shame....thanks for all you've done! Your tutorial on SCS about the snow globe card is SWEET!!! I just ordered the snowflake acetate, so I can't wait to play & make one of these! Thanks for the heads up about this card drive for this sweet girl! You cat is cute!! Great card! Thanks for caring and sharing! Thanks for the chance to hop for Jamie. Your card is great. I have made a card for Jamie also. Such a tragic story. what a beautiful card and what a wonderful idea. i have made a card and is ready to post tomorrow as I will need to go to the post office as it reqires an airmail stamp. The post on my blog can be found here. and my sons are going to make a card for Jaimie too. So glad to be a part of spreadig the love with you! What a cute card, and a great cause! 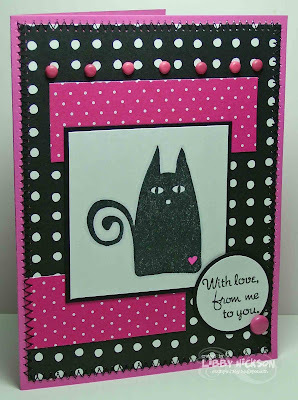 Oh I love the cat and the dots, it´s a perfect card! I just love your card!! Your card for Jaimie is gorgeous! still a hopping for a wonderful cause, what a wonderful card ands thanks for joining in the hop and sharing your talents! The colours are amazing! She'll love it. So cute! Thanks for joining in the Spread the Love blog hop. I'm overjoyed at the number of caring people in the stamping community - Jaimie's sure to be pleased! My card is here. Very cute! I'm loving this hop. So nice to see so many caring people out there!